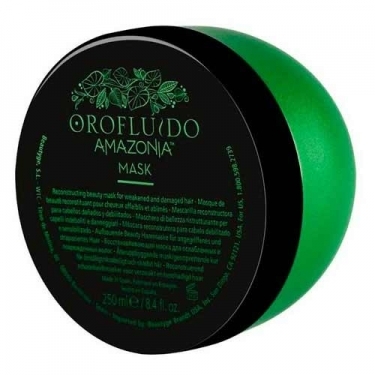 DESCRIPTION: Amazonia Mask from Orofluido is a mask, which helps to nourish deeply and regenerate, while adding texture and volume to the hair. Rich cream formula with a combination of powerful natural ingredients: murumuru butter, sacchi inchi oil, açaí extract and keratin, for a gentle, regenerative and illuminating cleansing action. The hair is soft, supple, revitalized, luminous and full of volume. Ideal for fragile and fine hair. Exotic berries fragrance with warm citrus and ginger notes and light floral touches. Leave on for 4 to 5 minutes before rinsing thoroughly.